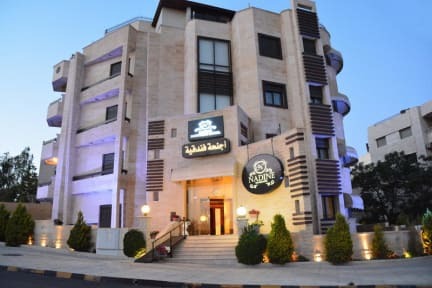 Nadine Hotel & Suites is 1 km from the US Embassy in Amman Jordan and 1.8 km from Jordan Gate Towers. Closest Landmarks: US Embassy 0.9 km, Baraka Mall 1 km, Modern American School 1.2 km, Royal Jordanian Airlines Headquarters 1.3 km, Wakalat Street1.5 km. Most Popular Landmarks: Jordan Gate Towers 1.8 km, Zahran Palace3.1 km, Al Khaldi Hospital 3.2 km, King Hussein Business Park 4.5 km, The Islamic Scientific College 4.6 km. 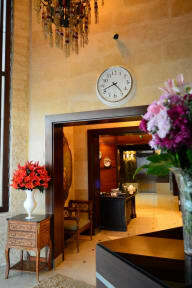 Queen Alia International Airport is located 27 km from the property. An airport shuttle is available upon request. Offers Apartment with one room or two rooms with siting area with self-catering accommodation, family rooms, single rooms, breakfast available in the rate of the rooms too. Free Wi-Fi is available in all areas. The property offers free parking on site. A garden and a terrace. Other facilities like a shared lounge, and information and tour desk. Apartments and Rooms at Nadine Hotel Suites feature with a flat-screen TV, air conditioning and a balcony. Complete with a microwave, the kitchen also has an oven and a refrigerator. Featuring a bath or shower, private bathroom also comes with a hairdryer. Taxes not included - 26.00%.